Here is a quick update. I changed the intial heightmap to just 15 feet. I think this came out much better for what I want. Looking good! and a good idea to use an invisible wall to contain the physics. I'm not saying a replicator wouldn't work as well, just providing an alternative. Either way (or both??! ), you might consider a few strategically branches placed manually to finish it off. P.S. I just tried a simple physics sim along these lines, and the "branches" all fell through the container I was dropping them into, so you might be better off with a replicator... I tried various ways to get this to work, (higher branch poly density, higher container poly density, increasing sim accuracy, etc) all to no avail. The branches were slowed down, but they dropped through. Thanks for the suggestions, Headwax. Not sure how to use the coverage pass to add noise, but look forward to experimenting. I feel like I have taken my first few steps to take advantage of multipass rendering but am still very lost. Please keep the suggestions coming. Just use it as a matte to add whatever effects you want in post. Image 1 is a new head I am working on using Vyusur's suggested tutorial (from another thread...). Image 2 is Carrara's native Fragment Coverage pass. Image 3 is my custom 'Toon part III' pass. Thanks head wax for ideas!! Image 4 are the 'Toon part III' settings. I also set the Backdrop in Carrara to white. You can see I set the Object Edge to 6 to fatten it up, and Distance to 0. Image 5 is the matte with some fractal noise in After Effects using the pass as a matte. You should be able to use the matte in any compositing software of choice, with whatever effects you want. Hope that helps, and doesn't muddy the waters. You are creating great work diomede! DesertDude, that head model has great character. Mine all look the same. Nice. And thanks for the instructions on the fragments. So much to learn. Here is a WIP with lots and lots of placeholders. Click to see full size. The grass is Carrara hair. The trees are some generic trees I created a while ago. I used a replicator for the beaver dam, but the sticks are just primitive cylinders with modifiers applied. 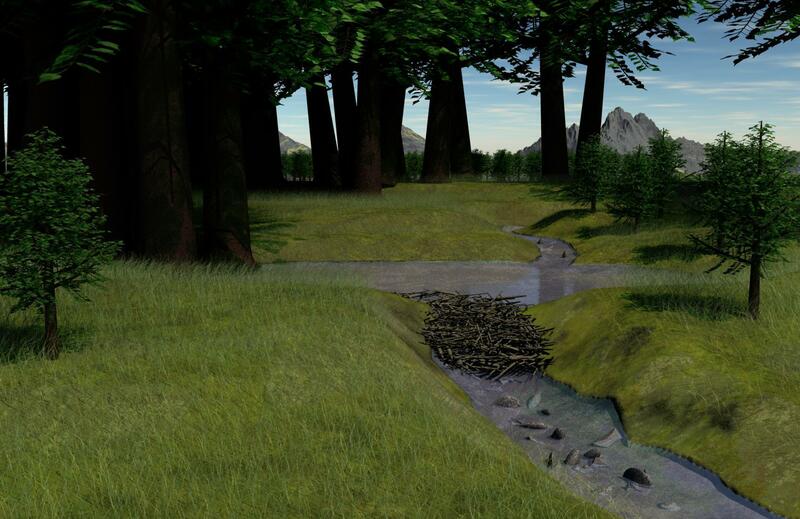 Similarly, the "stones" replicated in the stream are just primitives with modifiers applied. Need to replace as much as I can by the deadline. I have a distribution map for the stream banks that I have not used yet. I hope to model atleast a few plants native to western Pennsylvania. And I also need to replace the distant terrains. Or maybe just change the shaders. Look much more like the Rockies than the Appalachians at least to my eye. I'm also thinking that maybe PhilW's hair for the bear could be used. Thanks diomede, you have been very inspirational for me to get back into all this modeling stuff. I think I commented in this thread or somewhere else that I got really burnt out and frustrated and nearly dropped out of 3D altogether a few years ago. Also, like Dartanbeck said in another thread recently, I want to help put to rest the zombie lies that Carrara has inferior modeling capabilities. Carrara rocks! Your landscape image is looking great! A little more variation for the trees, in scale and leaf color. Throw a little red, yellow, brown in there...Mother Nature is beautifully imperfect and varied. When you are finished lets talk about some strategies for post work to add some nice atmospheric perspective - especially coloring the shadows instead of Carrara's native drab black shadows. Then your image will sing to the stars! Just suggestions from my own limited R&D. Really loving that scene! The banks along the river are just too cool. I personally think it looks nicer with the water level a little bit lower to show those vertical edges a little better... but that's just me. I love the hair grass. Subtle is wonderful and that shader for that light grass is just awesome! I also really like the mountain in the background. Really nice! Primitives with modifiers? Really? That's so cool! DesertDude suggested colour variation in the trees. You can either use a colour gradient and use something like a fractal pattern for the control, if you use Global rather than local shading, each tree will look a little different due its different location. The alternative is to use Sparrowhawke's Instance Randomizer as the control for the gradient to make each tree a separate colour, great for an autumn scene where some trees are more changed in colour than others. (Note that I defiantly used the British spelling for COLOUR throughout!). You can either use a colour gradient and use something like a fractal pattern for the control, if you use Global rather than local shading, each tree will look a little different due its different location. In addition to setting the fractal noise to Global, you will need to set a scale to a very low value which suits trees and the area that you are trying to cover. Here is a quick example with a scale of 0.01 and very exaggerated colours so that you can see the effect clearly. Obviously you would want to subdue this into more realsitic shades for a real project. And here is an example which uses the Instance Randomizer to control the same gradient - as you can see, the colour for each tree is consistent, but varies for each instance - the trees are all duplicates of just the one tree, with just the one shader. You could of course consider combining the approaches so that you had a subtle variation in each tree and a larger variation between trees for example. Those are great examples Phil, thanks for the illustrations and explanations. Yeah, I have noticed from past experience that switching from Local to Global space using various Noise functions usually requires some scale adjustments so that's a great FYI. (Note that I defiantly used the British spelling for COLOUR throughout!). I remember when I first discovered HP Lovecraft and how he romantically adopted the way you all spell words I tried to emulate him in my own writing for papers for school...didn't go over so well, but...it's so much classier. As I vainly remind my readers, tea is properly drunk hot, colour, honour etc. are all spelt (with a t) correctly, Z rhymes with Fred, and it's LEFFtenant not LOOtenant! Of course no one takes a blind bit of notice! I kinda flipped when spell-check kicked back "learnt" as not being a word! And I'm from United States! Thanks for all of the suggestions. Hope to create a few trees and ground cover that might more closely resemble the mid-Atlantic. When I do, I will try to get more variation in the shaders. I always forget that I have the instances shader plugin. I don't have the stones to correct a professional writer's spelling of color. LOL. Instead, I will attempt to redirect the conversation. 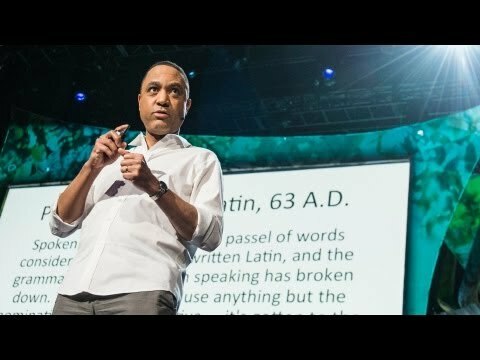 Here is a TED talk on LOL. Taking a break from the landscape image for some virtual something or other dynamix draping. I saw Phil post an Elvgren-inspired pinup and realized I hadn't used that cool plugin in a while. Wow, I forget how to do stuff if I don't practice. Ultimately, this will be one of those vintage pinups in which a woman is carrying something and walking a dog. Here are some steps on the basic figure. - loaded a G2F and applied a custom shader based upon theYsabeau texture maps. - still at the zero frame, I morphed the figure to its basic dimensions, but also applied morphs to minimize the bust and the glutes. - modeled a base clothing mesh, which is actually made up of 2 polymeshes, a blouse and a skirt. Saved the base for future projects. - customized the clothing mesh for this project. I decided on a 2-button, long-sleeve, cuffed blouse, and a high-waisted pencil skirt. Uvmap it and all that stuff. - advance timeline many frames and then remove the small bust and small glutes morphs. Apply a canned pinup pose and then adjust limbs to carry something. Adjust hands and expressions. - fire up the cool plugin - FADE TO BLACK because we don't discuss the specifics here. - the cool plugin returned a triangulated version of my clothing mesh, with morphs for each frame, draped to fit the figure shape and pose. - advance timeline to desired position and note frame number. Need this frame number to use vertex modeler in posed position to adjust the clothing mesh. - note, my mesh split in a couple of places - each split occurred in a place in which had a uv seam - could be a coincidence? I attached a screenshot of the side of the torso where one of these splits occurred. Anyway, no problem, I used the vertex modeler to close the splits and validated the morph changes. I also made a couple of other adjustments just because I could. - I then went back to the first frame and added some 3-point lighting. - I applied shaders to the clothing mesh. This included blue pinstripe for the skirt and a white blouse with vertical lines of slight adjusted alpha. Applied a metalic shader to the buttons. - I also loaded some shoes and conformed them to the figure. Ha ha, it might help if I actually activated the lighting! Same scene. Same invitation for suggestions. in this light - you can still see the seam along the left side of the blouse. Ha, I'm currently doing a G2F figure with modelled clothing and the cool plugin, and not a dissimilar pose too! My clothes are different though. Yours is coming along nicely! @diomede, very nice clothes and UVs! Thanks for the nice comments, Phil and Vyusur. Apparently, the older part of the forest near where I grew up had white oaks, but most of the newer growth was yellow birch. Not sure if there is a reason for that but found it interesting that there are significantly more trees in the eastern part of North America now than there were in 1890, including dominant trees (over 80 feet tall). Hopefully. that means Tuesday won't be Soylent Green Day for a couple more decades. Going forward, I hope to get over to the botanical garden and the arboretum to get some custom reference pics of individual plants. But for now I will have to be satisfied with some of these forestry guides. LOL - I am embarrassed. I have a long way to go. 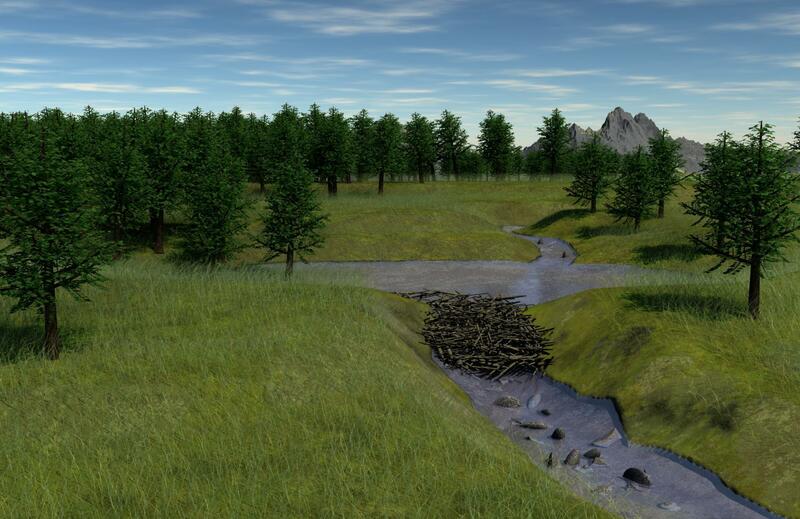 I just inserted some cubes of different heights and realized that my trees in the beaver dam render were more like shrubs. My trees were only 12 feet tall. Pennsylvania's trees should be much much taller. The name means Penn's woods, after all. Here is a reference pick with cubes of 100 feet, 80 feet, and 60 feet in height, along with the custom tree that I used in the top render. Now, how is a beaver expected to construct a decent dam without any trees? Maybe the beaver would only take juvenile trees as a full grown one would be just too much to manage? 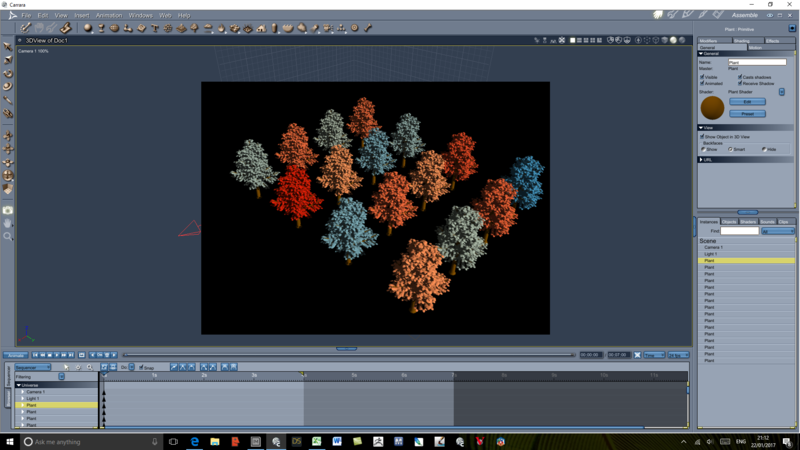 In this, I changed the tree height in the tree modeler for the tree in just one of the replicators. It looks like the tree height box rescales the whole tree instead of making it taller with more side branches. I'm guessing that because the scale of the leaves changed a lot. The difference between the rescaled trees and the original trees is stark. This makes the stream and the pond look much smaller, but I think it is closer to what I had in mind. The oiginal made it look like the beavers had damned the Schuylkyll River. Back to the Beginning (of my Carrara experiments). Aha, just found a treasure trove in the very first monthly challenge thread. It had a garden theme, and there are a lot of good tips for plants. I had modeled a tree trunk and a few branches then replicated subbranches and leaves on the limbs. The other thing I might take another look at is for the distant mountain. 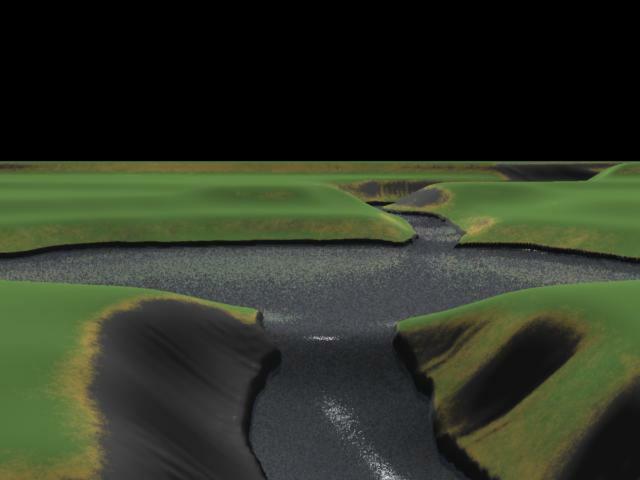 I duplicated the terrain and then appllied a spike effect and a green shader. Lower the duplicate just a little and the distant mountain will look like it is covered in trees. Hopefully, I have improved a lot from this old image, but some of the lessons in the thread and from this original experiment might be worth exploring again. Here is my first monthly submission with my first low res custom human. See the distant mountain on the right? I had tried the duplicate with spikey green trick on it. 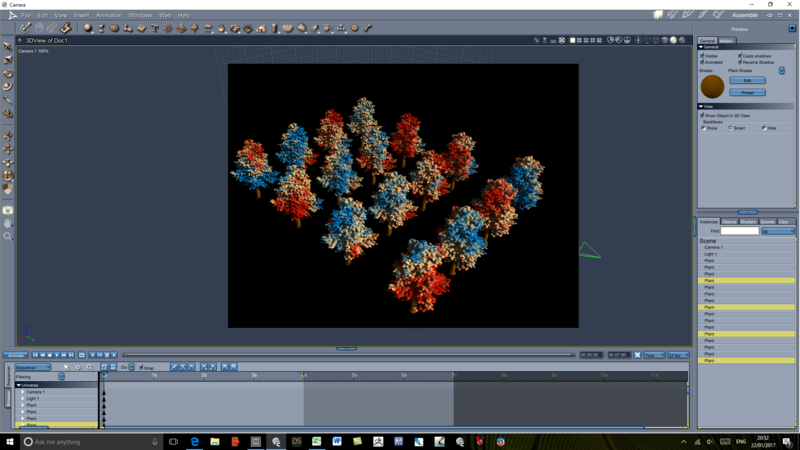 The tree in th foreground is a vertex model with replicated subbranches. Cool work on both images! Well done. 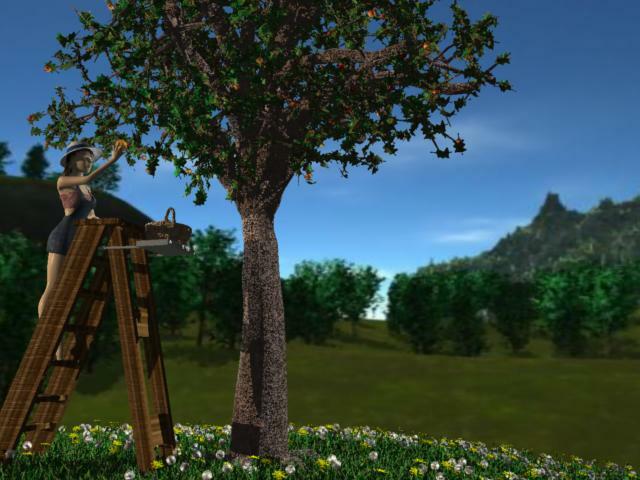 The "girl up a ladder" render I did (or rather, tried to do) for Tangy Apple Orchard was rejected. The poses were off and the composition was awful. I really must get the hang of this rendering lark someday . . . Thanks, Phil and Tm. 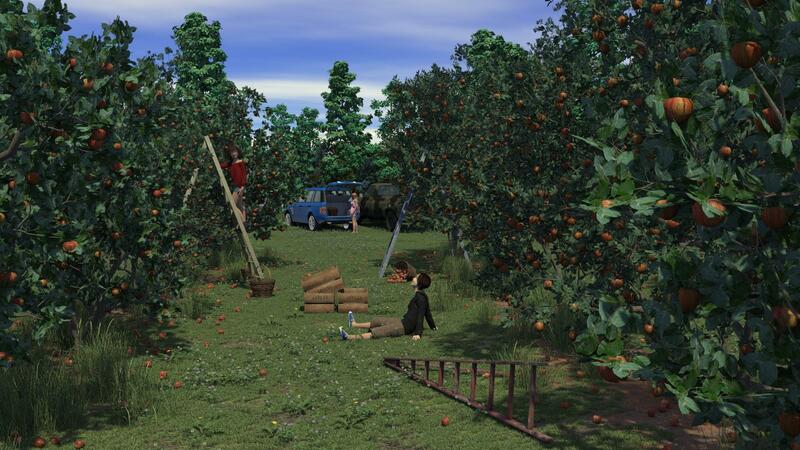 I am a huge admirer of the apple orchard set. When it first came out I was going to do an Elvgren-style pinup in it, but I got sidetracked. I think Elvgren had a thing for apples. Your Woman up a Ladder in an Orchard image is so much better than mine, right down to the dandelions! Now I am discouraged. If they reject that image, then I have no hope of creating acceptable promotional renders. I have been taking apart some of the trees that I see made for Studio. I've excerpted a small section of the mesh of one of Predatron's trees. Shouldn't be enough to give away any trade secrets or allow anyone to infringe his rights. But if it is improper, let me know, and I will delete the screenshot. The mesh has over 480,000 polygons. Others are in that same range. The shaders are texture map based, but I guess that is to be expected for Studio. I was a little surprised that the leaf textures made no use of the alpha channel, but I guess that level of detail only matters for close ups. My strategy will be similar to that tree that I made for the first monthly challenge. We will see how much my modeling, uvmapping, and texturing skills have improved. Two alternatives occur to me. 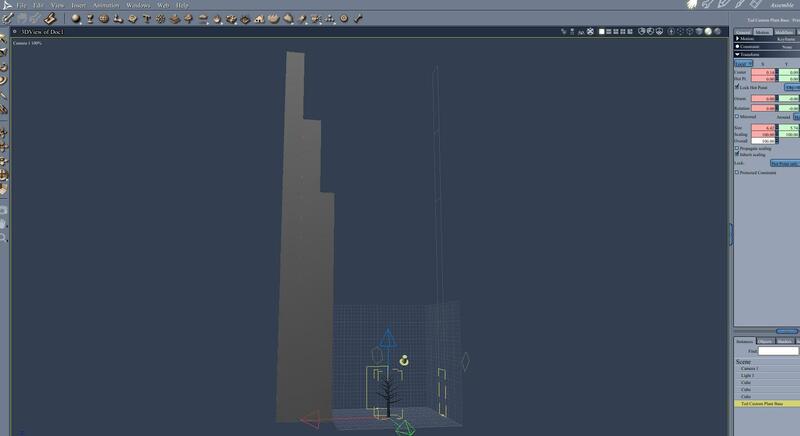 The first would result in a single contiguous mesh by using duplication within the vertex modeler and then welding branch endings to the trunk. The second would allow the limbs to remain distinct meshes and just replicate them on the surface. Model a couple of leaves and replicate them on a branch. Morph a couple variations of the branches and then replicate those on a limb. Morph a couple variations of the limb and then replicate them on a trunk. Then convert all the replications to meshes. Either way, import to Studio and Poser and see if the shaders can be made acceptable in those programs. In Carrara it's practical to make a high poly leaf (or branchlet), since the leaves are replicated onto the trees and don't add a huge amount of overhead. Don't forget to orient them the correct way though (I noticed yours are all face-on. It usually takes me 2 or 3 goes to get it right!). But beware if you export to .obj for DS etc - you'll easily end up with millions of polys! Transmapped/alpha leaves can look really good. My apple trees have alpha leaves (actually each "leaf" is a branch end with 6 or 7 leaves on it). There are downsides though: transparency effects take longer to render, and a lot of trees done this way can have a dramatic impact on render times. Also transmapped leaves on a plane are noticeably flat. It's easy to spot a transmapped tree! Exporting a tree into DS usually ends up as an exercise in "How much can I poly-reduce this tree and have it still look good?" 480K is a heck of a lot of polys. Okay for a "hero" tree, but less so for a jobbing tree in mixed woodland. Even with Ultrascatter. It pays to think about how your tree is going to be used, and let that influence its design.